Bring smiles on the faces of your dear ones with this Lovely Collection of Ten Yellow Gerberas and make your bond stronger. 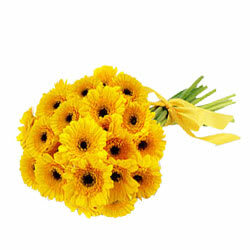 Amaze your loved ones by gifting them this Distinctive Bunch of 12 Yellow Gerberas and make them crave for more. Amaze your loved ones by gifting them this Distinctive Bunch of 15 Yellow Gerberas and make them crave for more.